If you are looking for information on the Rotobrush franchise business opportunity, Rotobrush franchises or Rotobrush franchising, then you have come to the right place. Rotobrush® provides anyone committed to actively managing a service business the opportunity to work for yourself, with the flexibility to work full- or part time, and achieve financial freedom. You've always wanted to be your own boss and make your own destiny. At Rotobrush International LLC, starting your new business is easy and profitable. Rotobrush gives you freedom to build income at your own pace. Part-time, typically you can earn US$25,000 to US$75,000 performing one to three jobs per week. Work full-time and you're on your way to real financial independence. Air duct cleaning is the fastest growing segment in the Indoor Air Quality (IAQ) industry, and Rotobrush is the market leader for equipping the IAQ professional. Some of the reasons customers get their air ducts cleaned include removing of everyday dust and debris that has accumulated in ducts over time, increasing the indoor air quality for allergy and asthma sufferers, and eliminating construction dust and debris in new or newly renovated homes. Seeing is believing! The new i2CAM™ marketing video inspection system effectively sells the need for air duct cleaning for you. Use this portable camera to show customers just how dirty their ducts really are. Jobs sell themselves. Then, use the unique Roto-Vision® video inspection system for on-the-job cleaning. It's a real credibility builder that creates loyal customers and great word of mouth. 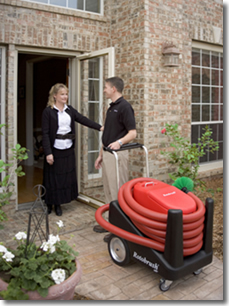 The Rotobrush aiR+® air duct cleaning system goes anywhere and does the job fast. It requires only one person to operate, and it fits easily in a truck and most vans or SUVs. The unique pod design allows the power unit to be lifted out of the carrier and easily carried to any duct access. The Rotobrush aiR+® system couldn't be simpler to learn and use. Rotobrush provides all the resources you need to get up and running fast: hands-on training, 24/7 technical support, and marketing tools to help sell the service. We're not a franchise, but we give you all the support you would expect from one at little or no cost to you. 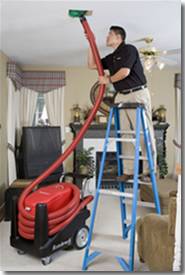 Clean the air ducts with the Rotobrush aiR+®system.